So let me begin by saying that command hooks are probably one of the most useful things you can have around the house. Like seriously, you can use them to hang up decorations or appliances. They keep things out of the way and provide a fun outlet to get creative. How much more useful could they be? Well, below I found some awesome ideas on how they can be helpful in your life and how you can use them. They’re practical, but they can also make rooms like your kitchen look awesome. So check out the hacks and tips below and let me know what you think! If you’re a coffee addict like me (ok, I’m not an addict, I just really like the taste of coffee), then this is a great way to keep things organized and ready to-go on a busy morning. You can get command hooks here! A fun way to keep things together and easy to grab, is to put a command hook on the side of an oatmeal/cereal container and hang your measuring scoop on it. That way you’re not taking too much, but you’re also keeping like-things together (if that makes sense). Place the hooks sideways and let your toothbrushes hang off the side of the medicine cabinet. It’s a great way for them to dry and stay germ free. If you cook a lot, then this is a great idea! Just hang some of your most used appliances (or the ones that look the best), and keep them up and out of the way. Also, it leaves just a bit of extra room in your cupboards. We all know how annoying it is trying to find the matching lid to the pot you’re using, but when you use command hooks to organize them, then the problem goes away. This is probably one of the best ideas ever. Trash gets everywhere on long road trips (I would know, I took way too many road trip from Southern California to Northern California just to see family), and this is a great way to make sure it stays clean in the car. You can get a bathroom tray here! I thought this was a great idea! I hate it when the trash bag always falls into the trashcan, so using a command hook upside down to hold it in place is an awesome hack! If you bake as much as I do (which is a lot), or even if it’s something you like to do during the holidays, then this is a great hack. The blogger from Two Twenty One found a great way to keep your baking appliances organized. 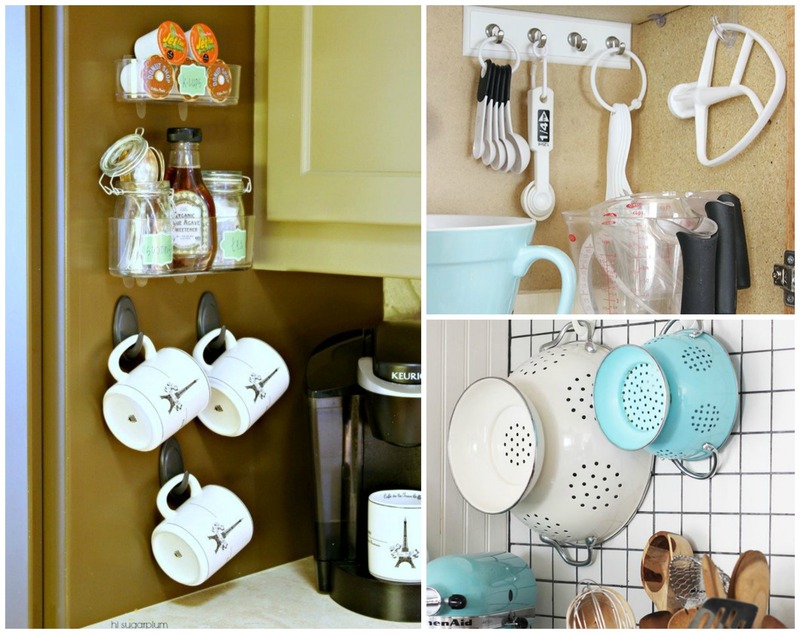 Alright, so I just talked about basket organization, but I really like this idea on hanging a basket with command hooks and storing items you use a lot in the kitchen (or bathroom). You can get a basket here! Now whether you want to get organized or hang up some items to decorate your home, command hooks are a great way to do just that. They’re easy to apply and a great price. Definitely something you want to think about when spring cleaning or wanting to organize your necklaces. Now if you have any command hook ideas yourself, let me know in the comments down below! I’d love to hear about them! Oh no! Thanks for letting me know about this Jes! I enjoyed the post. The tips are very healthful. Thanks for sharing them. Great idea’s thanks. Definitely using one for trash can for my cats when I clean,their litter, it always slides down. Thank you so much. I found them useful to hang curtain rods. You need the right size for the diameter of the rod. I didn’t want to drill holes for the screws so I just put the hooks up. Works great. Thanks for letting su know Teresa!